3.8 L - 4.39€ (1.16€/l) 2 x 3.8 L - 2 x 3.85€/un. 8 x 3.8 L - 8 x 4.16€/un. 2 x 3.8 L 2 x 4.39€/un. 2 x 3.85€/un. 8 x 3.8 L 8 x 4.39€/un. 8 x 4.16€/un. If you are looking for a low maintenance for your cat litter option, the silica sand is your best option. Silica is a mineral non-toxic. Technical Pet sand cares for the environment. 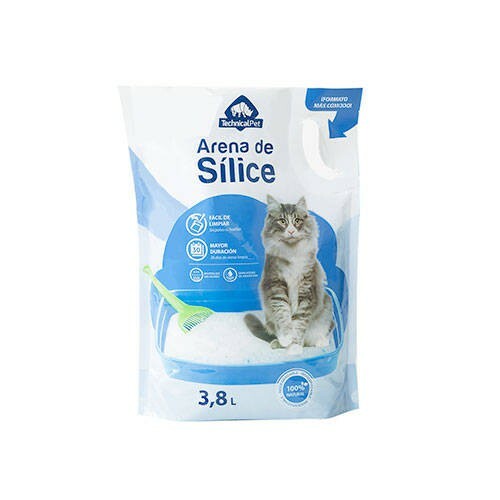 The incorporation of this organic compound to the kitty litter is an innovative solution that eliminates all the problems that generate the traditional arenas. The silica sand Technical Pet has a great absorption power, acting as a sponge and avoiding the formation of moisture in the bed. You will only have to remove solid waste every day, something that is very simple because of its texture, and the sand is ready to be used again. Add to these advantages that, thanks to the high capacity of absorption, neutralizes odors, making your pet feel more comfortable on his deathbed. Another of its properties is that a bed is easy to clean, that does not loose dust or leave footprints. When your cat exits the sandbox, he will not let those pesky marks on the ground, helping you to have clean the area where you have the sanitary tray. Silica crystals are of small size and not stick to the legs or hair from your pet. It is an extremely soft material, so it takes care of the legs of your cat. Unlike other arenas, the Technical Pet has a low dust content.Â In this way will help you to take care of respiratory tract of your cat, preventing irritations in the same.Â This is also an advantage for ti as protect your eyes, so that when you pour sand in the tray of your cat do not have to worry about the dust that may be generated. All this coupled with its antibacterial action, to protect your cat from infections associated with the traditional arenas. The silica get Additionally a longer duration: 30 days of clean sand. Its composition is specially formulated so that, in households with a cat, a bag a month is sufficient, with the consequent economic saving. In addition, its special formulation makes it much more light than traditional options. When the sand changes color to a yellowish tone, you must remove the dirty sand and replace it with clean. The silica sand Technical Pet comes in bags of 3.8 litres. And in a very convenient format! The bag is designed to make the task of filling the sandbox as easy as possible. Once opened the bag, thanks to the handle that has, just pick it up and tipped on the sandbox. Loose dust or leave footprints. Longer duration: 30 days of clean sand. Leave a layer of sand of 3 or 4 cm thick. Clean the sandbox once a month. Do not pour the remains to the toilet, as it can cause the clogged pipes. Clean the tray with gloves and then wash your hands. Leave in a cool and dry place. The Technical Pet silica sand will provide you care of your cat. His great absorption power neutralizes odors. You will have 30 days of clean sand without fingerprints or dust.